Seamless high-impact plastic is durable and chemical resistant. Fits most hotel and janitorial carts. Accommodates up to 4 1/4" diameter bottles. The unique threaded body disassembles quickly for sanitary cleaning. The body + head are polypropylene for maximum chemical compatibility. Overall length 16 1/8"; White. Standard with Poly Flap Valve (HDPE). Caster wheels for sealing bucket. 2" swivel, black w/gray rubber non-marking tread. Set of 4. Graduation marks in gallons and liters. Carrying handle. 12" x 9" x 10" H.
Graduation marks in gallons and liters. Carrying handle. 12" x 9" x 10" H. Lime Green. Chemical bucket with carrying handle and graduations. Perfect for measuring the proper amount of cleansing solution. Double rear bag (trash and dirty mop compartments), large pockets on 2 sides, front sleeve for duster storage. Lime green. Fits behind the PTBUCKET. Stores 4 round bottles. We've made it easier to hit the ground running by compiling an easy to use kit, specifically designed for restroom cleaning. Includes: (1) eMINI XL, (1) eHANDLE72, (1) ePOCKET, (1) eHANDLE grips, (12) eWAVE18PB, (24) eDOUBLEB, (24) eDOUBLER. Laminated wallchart and on site training. Add storage to Janitor Auto Cart. 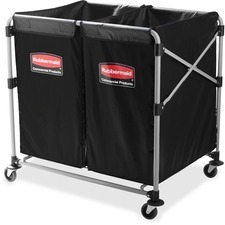 32 quart capacity bin, slides conveniently from both sides. Durable caddy organizer. Features cup holder placement for sprayers, quart bottle, cleaning tools and more. Designed for Auto Cart and universal use. Offers high-capacity storage and organization with comfortable mobility. Includes (2) yellow 6-quart small utility pails, (1) yellow utility caddy. Also includes (1) yellow vinyl bag. 45.5" x 21.88" x 36.75". Offers high-capacity storage and organization with comfortable mobility. Includes (2) yellow 6-quart small utility pails, (1) yellow utility caddy. Also includes (1) yellow vinyl bag. 45.5" x 21.88" x 43.75".